It's that time of year where the teachers are crying and the parents are rejoicing - back to school time! When I was a teacher, the calendar turning to August signaled that my carefree summer was almost over. It always made me a little sad knowing that I would soon be back in classroom. Now that I'm a SAHM, August means that school is about to start again and my load gets a little easier during the day. For the first time, all three of my kids will be in school. I was very overwhelmed thinking about my schedule. Here is what it looked like this morning. Are you exhausted yet? Me too! I was not looking forward to sitting in all those car pool lines. Burning gas while we wait in the carpool line and trying to get everyone out the door by 7:50 every morning. But then today I learned that Mark and Isabella are going to get bus services after all! Hooray!!!! The mom taxi only has to take Molly to school now. But with a 5 year old and 3 year old twins we need to put some serious thought into our morning routines so we have smother scream free mornings. Here are some of the rules that I will be implementing to make our mornings better. I recommended some of these ideas to my parents when I was a teacher and I used them after my son started preschool last year. It really helped us have smooth mornings. Time how long it takes you to get the kids up, dressed, fed, hair done, teeth brushed, shoes on, backpacks on, and buckled in the car or at the bus stop. Do this for at least 3 days. The day you did it the slowest is how long you need to get out the door in the morning. 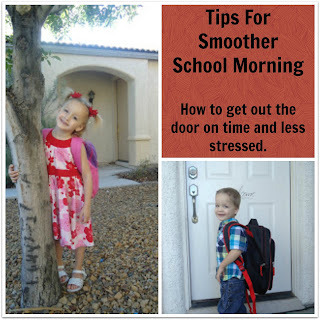 Snooze is your enemy here, your kids don't move faster when you're in a hurry. Pack lunches and snacks the night before. 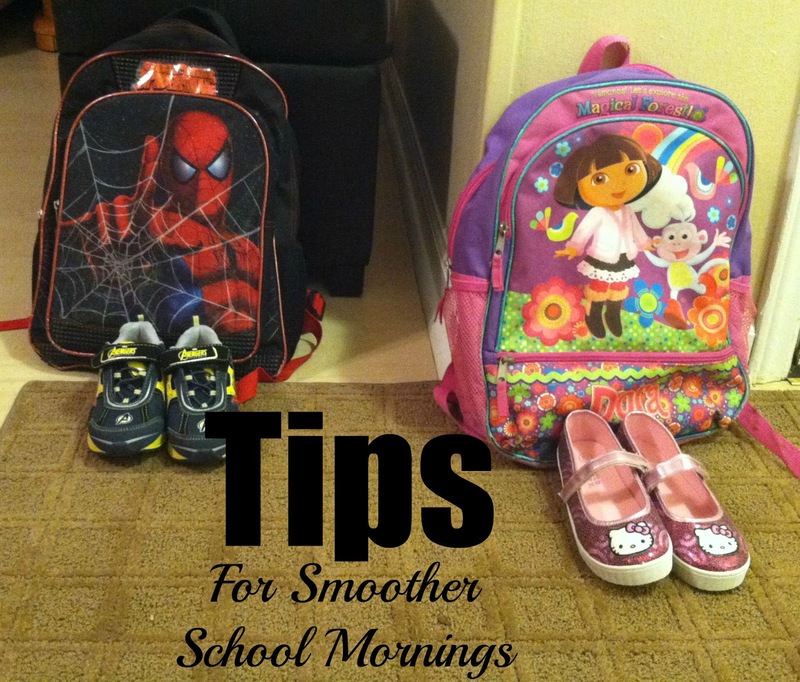 Make sure your kids thermos and lunch bag is clean and ready to go in the morning. Beginning in Kindergarten, make your child responsible for their own homework! This will take some time and discipline so be prepared for some serious training here. But it is worth the effort in my opinion. And no that doesn't mean you are not involved in the process. 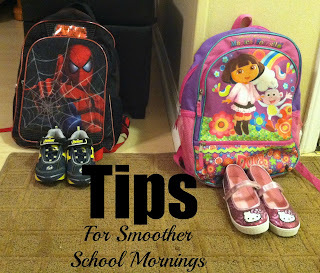 Please go through your kids backpacks the night before! Teachers send home notes in there and papers to get signed. The last thing you want is to have to stop and sign papers when you're trying to get out the door. You know, exactly the minute your kids remember it. Line up jackets, shoes, and backpacks by the door. I keep them on the floor and drape the jacket over their backpacks. It doesn't look pretty but it works and then you're not looking for shoes the next day. For elementary aged kids, mark the PE days on your calendar!!! I can't tell you how many times one of my students was in tears because they couldn't play in PE since they didn't have tennis shoes on. Kids tend to remember this once they're at school or the bus stop. I hope this helps you start your day a little smoother. I have to re-time our morning routine now that we're walking to the end of the street to catch the bus. And I've already implemented the clothing rule so it's not new on the first day of school. It's always good to implement anything ahead of time so everyone can adjust. If you're wondering if I'm talking about mom adjusting, I am! It's hard on everyone switching from lazy summer days to strict school schedules. Good luck on starting a new school year! Does anyone have an after the first day of school tradition? I'm looking for something fun to do with the kids when they get home from school.